Are you aged 16 to 18 and considering a career in care? Do you want to meet professionals and patients to learn from their experiences? Are you looking to develop practical skills that will help with future job or university applications? Then our Summer School may be for you. Every year we offer two five day ‘Summer Schools’ to 16 to 18 year olds interested in pursuing careers in the health or social care sector. The programme also provides them with a City & Guilds qualification to add to their CV before applying for further study or employment – a great way to make their application stand out from the crowd. Over the course of the week, students are given the chance to develop their understanding of person-centred care by experiencing and delivering practical caring skills with each other including feeding, teeth brushing and hand massage. Students will also meet a range of professionals and explore career opportunities in the health and social care sector as well as learning about caring for those at end of life. They even have the opportunity to meet people accessing our outpatient services as well as sit in on group discussions to hear patients share their stories. In addition, they learn about the importance of teamwork and explore issues around aging, dying and dignity. 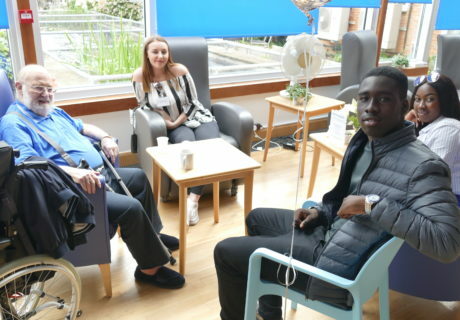 We recently received funding from Tallow Chandlers and City & Guilds so that, in 2019, we can share ‘Summer School’ with other London hospices and even more young people can benefit from learning about issues and care at the end of life.